As I come down the stairs into the empty restaurant, an elderly caretaker is waiting for me exactly as promised. He helps me retrieve my bike and then watches with an expression somewhere between amusement and disbelief as I stash my bags and gear. I’m dying for a coffee, but our communication is limited to a few nods and smiles, and him handing me the packed breakfast. I’m not entirely sure he’d know how to operate the espresso machine anyway, and my limited German is met with a blank stare. I settle for downing the carton of orange juice included with the breakfast, and a thank you (which does seem to be understood) before rolling out into the now deserted city streets. Parts of Gyor are even prettier by daylight than they’d appeared last night – the central train station has an especially grand old facade. Sadly, the potholed cycle lanes have not become magically smoother overnight as I bump and rattle back out to the main road I came in on. Something my energy-starved brain had completely missed last night was that my ride past Tesco and McDonalds was actually on the original route I’d planned to take. It comes as something of a surprise that when I do reach the main road, a simple left-turn sees me back on track again. In no time I’m weaving through backstreets and around a light industrial zone as the city gives way to countryside again. 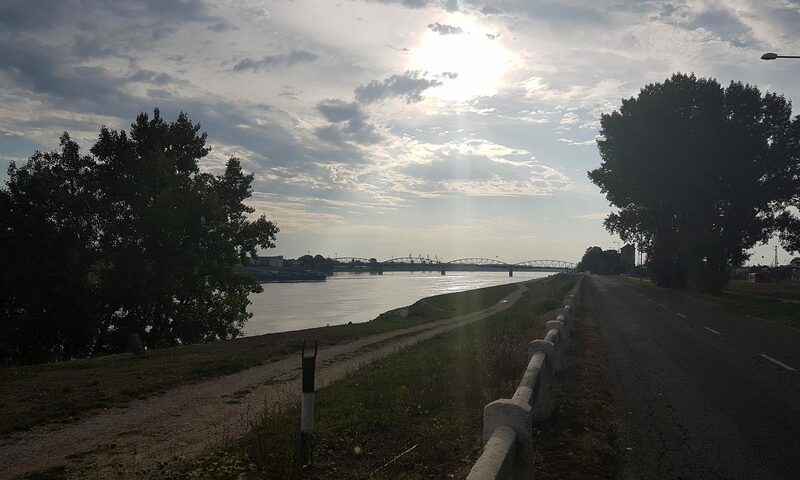 It’s a beautifully fresh, cool and clear morning and my spirits are restored – the border with Slovakia is only around 50km ahead. Standing in my way though is a confusing road junction. The route the GPS wants me to take is now a dead end – it’s been replaced by a freshly tarmacked section of road that winds across a new bridge. There is a very clear 3-segment circle stating no cycles are allowed, but I have no choice. With the old road closed off, there is no other visible way to get across the highway in front. Reluctantly, I take it. It’s only a few hundred meters before I’m over the bridge and back on a route that is allowed for cycling again, but the fact can’t be ignored that this short stretch, even though apparently unavoidable, was against race rules. I’m uncertain how much further into the race I’ll get, but if I do manage to reach the end I’m going to have confess and add it to my past (minor) transgression after CP1. The riding is flat, windless and fast and I make rapid progress through the last couple of small Hungarian towns before the border. 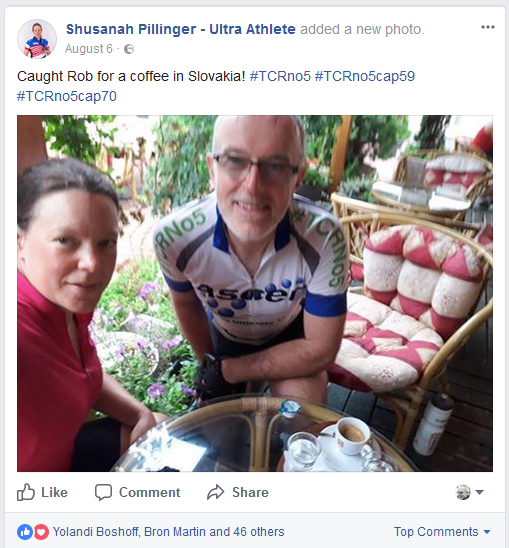 Unsurprisingly, I start to see a few other TCR racers – there’s only so many obvious places to cross into Slovakia, and this was bound to one of the more popular ones. It’s a relief to see the 2-segment sign (no pedestrians or horse carts) as I join the last stretch of main road (route 1) just after Ács . One of the other racers I greeted had headed off in a different direction which made me doubt my Google Street View research for a moment. Or words to that effect. Not only have we been in approximately the same vicinity, we’ve actually reached the border and the bridge at the exact same moment. Given that Shu was one of my inspirations for contemplating RAAM initially, it’s one of those coincidences that seem both impossible and inevitable at the same time. Crossing both spans of the long bridge, we freewheel down past the Slovakian EU border sign and into a new country. Surrounded by grey buildings and empty, silent streets, it begins to feel unlikely that we’ll find anything open at such an early hour on a Sunday morning. Somehow we decide to ride diagonally across the grass of a small park behind us. I’ve no real idea what made us head this way, but at the other side of the square there’s a low arch and some sort of sign above it (I forgot whether it was a hotel sign, or an Illy brand sign). The arch leads to a courtyard where breakfast and coffee are being served. A little astonished at our luck, we park up the bikes and grab a table. Despite the very different routes we’ve taken, our conversation follows many common themes: how well our bikes have performed; how surprised we are not to have made faster progress. We’ve ridden very differently though – Shu’s been on social media and keeping track of how others are doing, whereas I’ve just been head down trying to keep going. Shu seems more upbeat about the rest of the ride though, whereas I’m already contemplating how much farther I can get. Our short coffee and breakfast break is a wonderful hour away from the madness, but all too soon it’s over and the solitary pilgrimage begins for each of us again. By the time I reached open countryside Shu was nowhere to be seen. Whether she’d powered on ahead or gone a different way wasn’t clear, but I was alone again. The empty road stretched off ahead of me towards a distant horizon of mountains under dark, laden storm clouds. These, I guessed, were the Low Tatras mountains – the first of two significant mountain ranges which would account for the bulk of the 4,000m of climbing ahead. A great sense of calm came over me as I soldiered onward. There was very little notable about the scenery but I felt relaxed and was enjoying the morning’s riding immensely. I spent a significant part of this period inside my own head doing mental arithmetic. It’s something I do a lot on long rides, but this time it was of a rather different character. I already knew I’d be out of time at CP3 by some margin – it would rule out my chance of receiving a General Classification place, but not of getting a finishers time. The bigger problem was my likely arrival time in Greece. At current pace the most likely ETA would be somewhere between late on Wednesday 16th through to Thursday 17th. And I knew from route research the chances of picking up time were very slim – the road conditions would become progressively more sketchy later in the race. 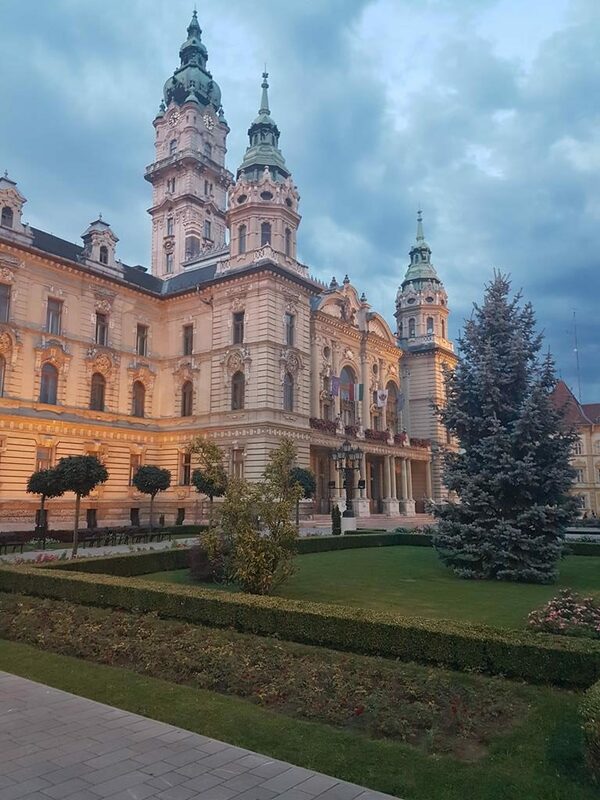 All of this led back to the thought I’d had last evening in Győr – I needed to consider the very real possibility of scratching before the finish. I pulled over at a track into a nearby field to call home and discuss this with Yoli. Standing there, I was absolutely sure that I didn’t want my TCR adventure just to fizzle out in the middle of some random field. It would have been trivially easy get to Bratislava or Budapest airports at this point (neither were more than a few hours riding away). But I felt a strong need for a proper, more definitive ending for my race. The only question was how and where to achieve that. 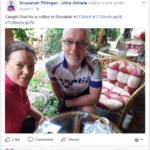 Although I’d love to ride to CP4 over the Transfăgărășan Highway, the inescapable fact was that CP3 made a lot more sense. I’d have time to fly to Greece to meet Yoli and Ben, and get to the finishers party. Pushing on to CP4 would rule both of those out. Oddly, I felt no hint of disappointed or sense of defeat as I rode on. If anything, realising that this was the last 300km of my TCR made me eve more intent on savouring each moment. At this point though, I had no clue how eventful the remaining kilometres would be. Looking closely at my track reveals a couple of short stops during the morning and, although I recognise the buildings on Street View, I have no recollection of what I stopped for. My best guess would be filling up with water, coffee, or finding a loo. I do remember developing a craving for ice cream, and have a vague memory that at least one of the stops may have been a failed recce to find some. The reason for one stop though is etched deep into my memory. and was accompanied by a screenshot of the Garmin eTrex screen, and a photo of the quiet village lane where it occurred. 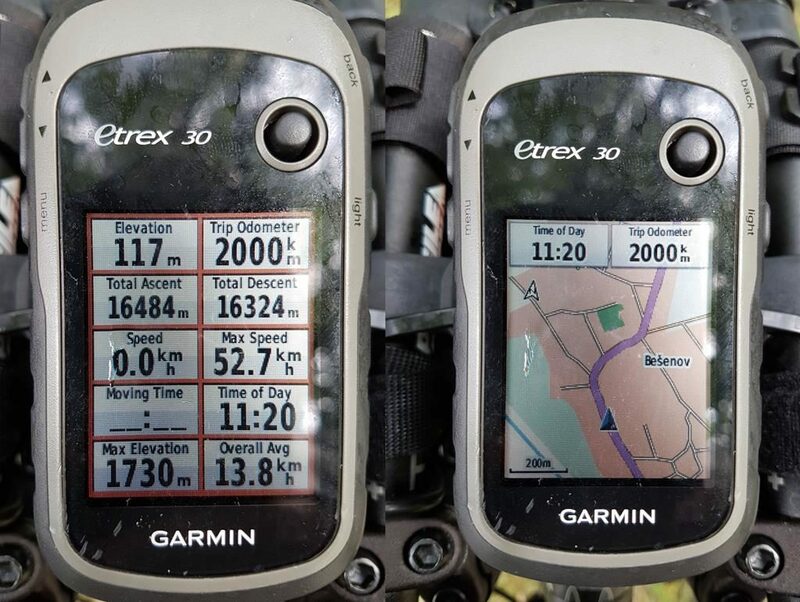 Rather fittingly, it was almost exactly four years since that same Garmin had rolled over 1,000km for the first time on LEL 2013. The day was becoming hotter, and the countryside began to roll as I approached the foothills of the mountains I’d seen earlier. I made a couple more stops before I reached them. Finally, at a shady, green corner of a town junction I spotted a promising looking little kiosk. 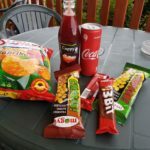 I sat there for a few moments quenching my thirst with a variety of juices, but most importantly their amazing selection of ice creams had finally satisfied the craving which by now had grown to monumental proportions. After my experience in Hungary, I was worried about finding places open on a Sunday afternoon. 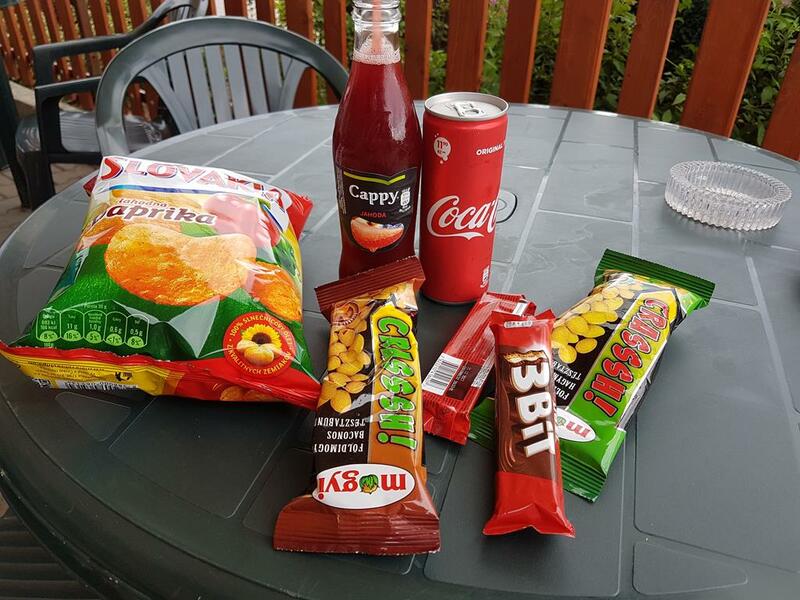 As a result, as well as fueling up, I also bought as large an array of snacks and drinks as I could cram into every spare space of my bags. I did not want to get caught out again without enough food to eat. As I sat enjoying the early afternoon break, my eye wandered to the scenery ahead. The road was clearly heading into a narrow valley between two steep hill ranges. I remembered very clearly this winding passage which followed the Hron river into the heart of the Low Tatras mountains. 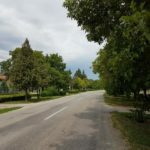 In theory it was a flatter and considerably easier option than the alternatives I’d found – but I was worried about the road. I was very uncertain how rideable or busy some sections might be. As I swung left onto the road into the valley my worries deepened, The traffic was extremely heavy – a steady procession of cars and trucks thundered past, given me little room. It was not a promising start. After enduring around 5km of sometimes scarily close passes the road signs indicated a junction with the R1 highway. I said a little prayer that most of the traffic would be heading onto the highway and that things would calm down once past the clover-leaf junction. Much to surprise, that’s exactly what happened. The road beyond the junction was quiet and scenic. 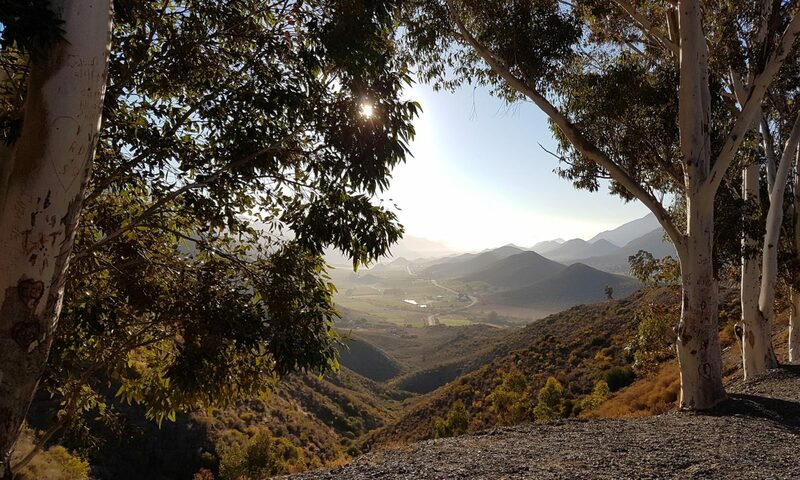 After an inauspicious start, the route through the first part of the valley proved delightful – glorious tree clad mountains rising up either side of the valley, quaint villages dotted here and there. In places there were patches of industry, but overall it was a wonderful afternoon of riding. I was beginning to get properly hungry, and remembered somewhere not far up ahead was a McDonalds – but another place caught my eye before then. I passed a large green sign with times indicating that the welcoming little cafe behind would be open. I circled back and pulled into the car park. A dark-haired girl in cammo gear was also heading in to the cafe. A short way in front was what I took to be her giant of a boyfriend or husband – although my assumption was largely based on the fact he was also clad from head to foot in cammo. As I got closer I realised that the survivalist look didn’t stop at their clothes – both of them had an intimidating array of large knives attached to various canvas straps and, what looked worryingly like real hand grenades. By now I was too committed to turn around and ride off, so I did what seemed like the next best thing – I smiled and said “Hi!” in the friendliest voice I could muster. It was a relief when they smiled and responded with an equally friendly reply. Panic over, at least for now, I headed inside to order food. The young girl inside the dark, wood lined main building, could not have been more helpful – she even let me plug my various battery packs and devices in to charge at the counter whilst I checked out the menu. I’ve no idea what made me order chicken soup with steamed rice and vegetables, but it proved an excellent choice. It was tasty, filling, and easy to eat. The only slight problem was my cammo clad friends, who’d now been joined by a couple of their friends at a table a short distance away from me on the pretty patio area outside. After about the third wave, smile and raising of a shot glass I figured I was risking offence by not at least chatting with them. I strolled over and did my best, in patchy German, to explain that I needed to get a short sleep and had a long way to ride so couldn’t really drink anything. It didn’t seem to appease them totally, but I got away with it. Heading back to my table, I ordered and drank a quick coffee before stretching out for a sleep on a long wooden bench. With a few cushions and rolled up blankets it was surprisingly comfortable. But being in sight of my heavily armed neighbours it wasn’t the easiest of naps I’ve ever taken. The serving girl came out to wake me about an hour later – my alarm had gone off on the phone still charging behind her counter. My hopes of being alone now were immediately dashed. After paying the bill I was going to have to run the gauntlet of the survivalist entourage one more time before getting back out onto the road. As I attempted to bid them farewell the cammo covered giant pulled out his phone and began proudly showing me his action shots. I’m no expert on guns, but I know a 50 calibre sniper rifle when I see one – although to be fair, with his large size it hardly looked bigger than a regular assault rifle. There was something vaguely disturbing about his grin as he talked me through the collection of photos. When he tucked the phone away I spotted my chance to leave – but stupidly, I joked that maybe he could shoot any bears which tried to attack me. Even now I go a little cold at the sound of the laugh he gave out as he said maybe he’d just shoot at me instead. He indicated with his hands that I must ride fast, and not straight. It wasn’t exactly easy to turn my back and wheel out to that parking lot. The weapon in the pictures wasn’t anywhere in sight – but if he was a half way decent shot, that thing would have enough range that he’d have time to drink a couple more rounds, pay the bill, fetch it, and still take me out. The garage I stopped at to buy a precautionary set of extra AA batteries for the ones I’d just replaced in the eTrex was around 2km in a straight line from the cafe, and so technically still within in range. But no shots rang out – either he’d been having fun at my obviously nervous state, or maybe he’d misplaced his car keys. Either way, my TCR was allowed to continue without coming under friendly fire. As the light faded though, it was clear I wasn’t going to escape the storm so easily. It had been humid all day, and the clouds that had rolled in small patches were now gathering into a dark, solid blanket looming over the valley ahead. Before long, the first large spots of rain began to burst off the tarmac in front of me. This was not going to be a light shower – I was in for a proper drenching. By the time I roll into the suburbs with the McDonalds the rain is pelting down hard. It’s getting hard to see through my spectacles so I pull into the shelter of a garage forecourt to swap them for contact lenses. My hands are filthy and shaking as I crouch over the flat surface on one of the pumps trying to scoop the lenses out of their case. It’s something of a miracle that both of them ended up in my eyes without getting lost or covered in grime. Tucking my riding glasses into a pocket I peer out into the dark watching the rain lashing down. It’s not exactly an inviting prospect – with a couple of deep breaths I force myself back out into the storm. My rain jacket at least keeps the top half of me dry, but the rest of me is liberally soaked before I’ve even got to the end of the filling station slip road. My humour is at least intact enough to smile at the guys who reckoned mudguards were a waste of time. Riding in the rain isn’t my favourite past time, but it’s infinitely better when not getting showered in your own spray. Water is sloshing out from my wheels as I make my way slowly through the urban sprawl. 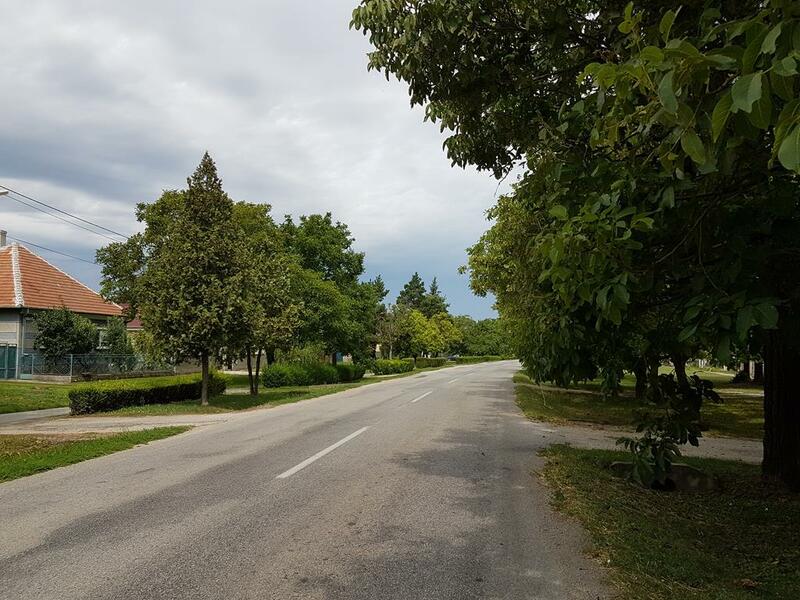 Before I get there I pass through the town of Sliač. I’d planned once again to ride through the night, but the prospects of doing so were not appealing. Up ahead was a high and remote mountain pass – it’d be strenuous, most likely cold, and there was that thought of bears too. I’d reach CP3 sometime tomorrow anyhow, it seemed to make much more sense to enjoy the majority of the scenery in daylight. But the idea of a comfy bed and a warm hotel proved a lot easier to think about than actually find. The first place I spotted was on the opposite corner of a traffic light. The name had “Penzión” in it, so maybe they’d have a spare room. The elderly receptionist or night manager didn’t utter a word in reply to my query. Just an unfriendly shake of the head. I sat on the foyer couch and whipped out my phone to scan for other places in the vicinity. It was a short and hard two-seater, but maybe I could curl myself up to catch a couple of hours kip on it. But I was sat in full view of the front desk, and no sooner had the idea popped into my head than the pension guard cast a disapproving frown in my direction. Just down the same side road was a B&B which looked worth a try – even better, the weather had cleared briefly. The combination of heat and rain though had unleashed a thick cloud of large insects that I had to battle through as I crossed over the river and into the road full of houses beyond. It was a wasted journey too – the B&B was closed up with no signs of life, leaving me to battle back through the locust-swarm a second time to get back to the main road. I start to see clear indications of the airport – high fencing beside the road, runway lights and boards for car rental. One thing I don’t see any sign of though, which I’d assumed an airport would have, is a hotel. As I pass the main terminal it also looks very closed. Clearly this is the type of regional airport which has a handful of flights per week, if that. On the other side of the road I keep seeing signs for a golf hotel or conference center but although I could make out what seemed to be the fairways, I somehow failed to locate the promising sounding accommodation. Fortunately, the rain was holding off and even with the cooler air I was drying out again rapidly. 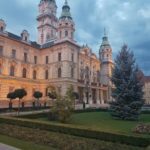 The sizeable town of Banská Bystrica was not far ahead, and as I reached the outskirts I pulled over to make a more focused effort to find somewhere. Remembering the unfavourable result on Bookings.com the night before I resorted to a much more direct option – doing an ‘Accommodation Near Here‘ search on Google and actually calling them direct. The first couple hung up on me either without answer, or just a “No” in reply to my enquiry. A very polite lady with perfect English answered my third call. She could not have been more helpful, and within minutes a room was booked and I was on my way again. Just in time too – as I reached the brightly lit city centre, the rain was bucketing down again. The wet roads reflected back the neon shine of the brightly lit shops and offices – it made for a rather beautiful scene, although it would have been nice to enjoy it from the dry. I passed an array of familiar signs – the large O2 one caught my eye, the cellphone network I’d just used to find my bed. I passed yet another McDonalds on my right with a long drive-in queue. I was tempted to go grab something, but decided not to chance my luck with the room. Just beyond the hubub of the centre I swung across the main road and headed into the back streets to look for the hotel. I passed it twice without realising the sombre grey-block facade was actually a hotel. It looked more like a municipal building, or maybe a library. Only a somewhat damp, but friendly passer by saved me from wandering blindly past for a third time. What happened next is, undoubtedly coloured by my visit to Russia as a teenager with my school. As I entered the foyer it was like stepping back 35 years. To the left I could just about make out the unlit and closed restaurant. Square tables and functional chairs in regimented rows. Reception was a simple square hole in a shiny marble wall, behind the desk of which was a short old lady who made up for a lack of any English with a series of friendly nods and gestures. Clearly the girl I’d spoken too was on a booking line somewhere else, or maybe she’d finished for the day leaving the night caretaker in charge. The lady was clearly very used to following a strict set of instructions – she handed me my key, indicated I’d pay at 6am the next morning when the manager came in, and showed me to a storeroom to store my bike. All without barely a word in common that either of us understood. Her parting offer was one that will live in my memory for ever. She said, reading from her list. I was tempted to reply that yes, I liked the Internet very much – but the humour of it would be lost, so I just nodded and waited as she went into a cupboard for what I imagined would be a slip with the WiFi key. After a good rummage she emerged beaming and proceeded to hand me a CAT5 Ethernet cable. It was such a simple, honestly helpful gesture that it was all I could do not to burst out laughing. Instead I did my best to explain in hand signals that I hadn’t brought a laptop with me and the cable probably wouldn’t fit my phone. She looked so deflated at being unable to help that I wished I’d just accepted the cable gratefully. Instead I made as many gestures as I could think of to say it was fine, and made my way to the stairs. Yes, stairs. And not just any stairs, but a grand wooden staircase sweeping up around each side of the square marbled lobby. It was impossible not to think of the grand old Soviet hotels I’d visited in Moscow and Leningrad, and the designated official who was assigned to shepherd us everywhere and make sure we understood the truth of what we were seeing. The room itself was small and perfectly functional – the decor dark but austere rather than dismal. A single bed filled the far end of the room under the window, sheets folded neatly at the corners, and a small mint on the pillow. With no chance of leaving early, I left the curtains open rather than setting an alarm. I tried to be positive about the chance of the weather being better in the morning, but it seemed much more likely that I’d be riding on again in the rain. Even so, I dried my gear as best I could before drifting off to sleep in my time-warp room.